The title screen cutscene already hints that the story will be a bit different from typical NES fare. 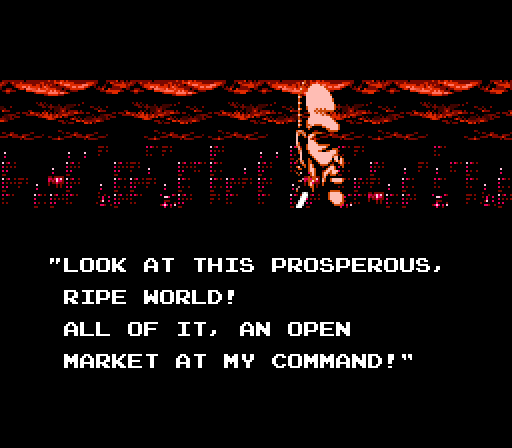 A criminal boss is planning on dominating the world, and “Project Doom” is mentioned. Apparently, it involves test subjects, and one of them has escaped. 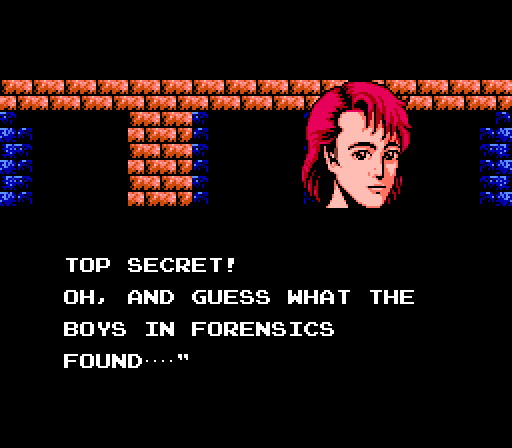 Then, a mysterious man is mentioned, and we can only guess what that is about. Either way, the mafia mastermind is certain that this man will come to him, just like he did 30 years ago… The scene raises several questions, then the game begins and we see the protagonist, named Hart, ready in his car to chase after some lunatic criminal. We can only guess that Hart will eventually face that mafia boss and put an end on his reign of terror. It’s not until much later in the game that everything will come to light, and we’ll learn of the villain’s true purpose and plans. 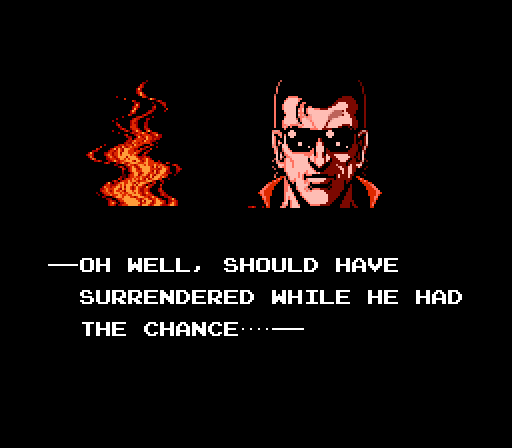 I suppose the story, as a whole, is a bit like an 80s action movie, but that’s not a bad thing, especially for NES games. It’s original, and it works. There are some touching moments. The cutscenes telling the story are nice, though of course nothing too flashy – the hardware can only allow so much. The cast also keeps true to that 80s action movie vibe – we’ve got the hero, the villain, the villain’s insignificant henchmen, and, of course, a couple of chicks drawn to the hero. 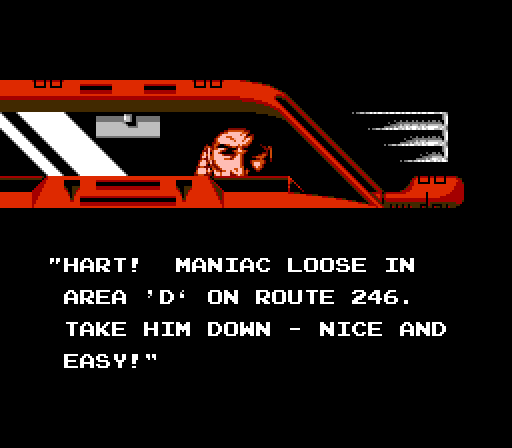 Hart is the star of the game, he’s a tough guy who has been through a lot and will do whatever it takes to fight crime. But the villain is also quite awesome, with his evil and unforgiving nature, and, of course, the desire to have the world in the palm of his hand and control the fates of people. Christy and Sophia, the two girls giving Hart support during his missions, are not elaborated on much, but it’s rather obvious that they have a thing fo him. Do not expect a complex love triangle, however, this is just an 8-bit game, not an elaborate love drama film. While the story is a nice and rather unexpected bonus, Vice: Project Doom’s main strength lies with the gameplay. 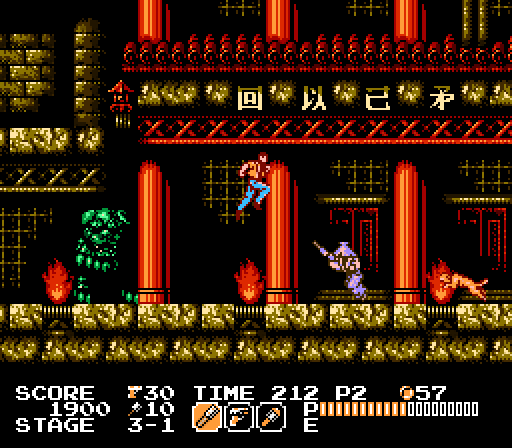 Most of the game is a side-scrolling platformer with an emphasis on action. 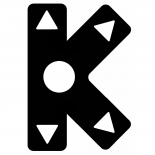 Enemies come at you all the time, and you have to use your weapons to dispatch them and proceed forward without letting them drain your life bar. The weapons at your disposal are the short-ranged sword, the pistol and the grenade. The sword is usually all you need and has unlimited use, but there are certain situations where you’ll need to use the others. You have to gather ammo for the pistol and more grenades during the stages. If you run out, the game is actually generous enough to restore 5 bullets and/or 2 grenades if you wait a little. You can also gather coins that destroyed enemies often drop – at 100, you get an extra life. For some reason, the pistol’s range is limited – bullets just disappear after travelling some distance. The grenade follows a certain trajectory and drops, it makes quite an impact as it explodes, hitting enemies twice if they stay at the same spot. 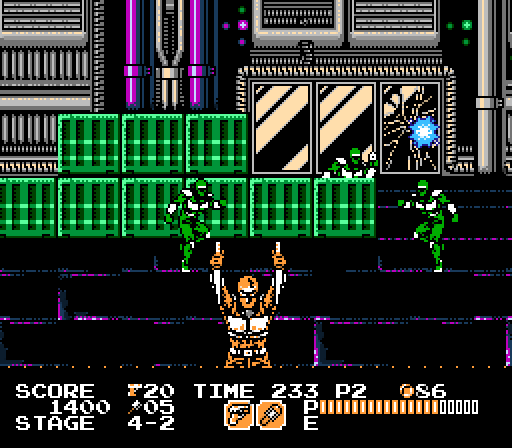 There are all kinds of enemies – some just try to run at you (yeah, like in most NES games, touching the enemy harms you), others shoot at you, ninjas try to attack you from above, etc. There are also other obstacles, such as pit falls, spikes, electricity, poisonous plants, etc., and you usually have to climb several levels up (or descend down) in the stages before reaching the end. One of the best things about the game is that you have infinite continues. Even if you hit the “Game Over” screen, you can always continue from the beginning of the stage where you died. Some skills and perseverance will get you to the ending. As I mentioned, there are a couple more gameplay modes that you’ll take control in during several stages. 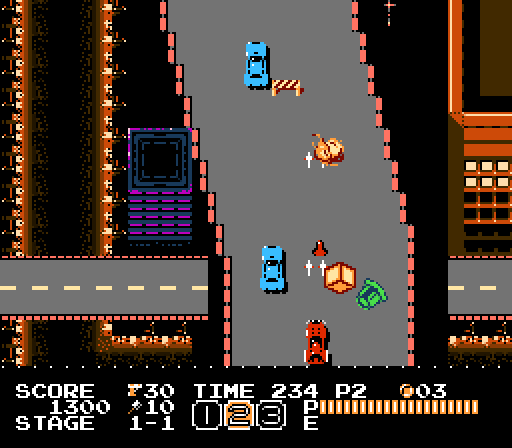 Already in the very beginning, there is a car chase stage. It’s very dynamic, enemy cars and obstacles coming at you as you drive really fast, you’ve got to shoot them down promptly and you’ve got to be paying very good attention to avoid getting hit. 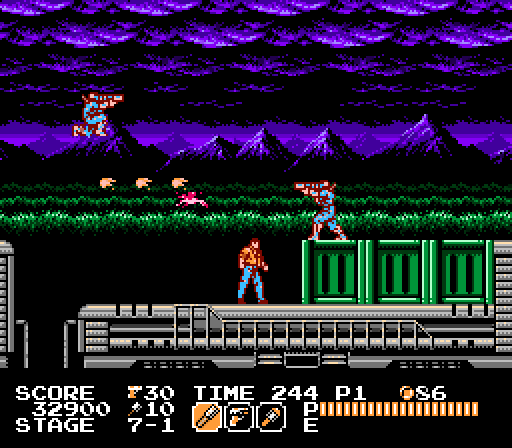 The health bar makes things a bit easier, though – you can survive even after getting hit many times, and, best of all, if you happen to die, you just respawn right there instead of starting at the end of the stage (or stage segment) like in the side-scrolling or gun sections. The shooting stages are also much fun – you move your target around and shoot at the enemies with your gun. These segments are harder because you actually need to preserve your ammo, and the enemies coming at you are many. Dying sends you back to the beginning of the stage, but eventually you’ll manage to muscle through without your life being completely drained. Boss battles are definitely a highlight. Bosses are menacing and deal a large amount of damage, while you only drain their life bars one piece at a time. They have as much health as you (if your bar is full), and that makes most battles difficult. But, with all of them, there is a pattern which you can learn and then exploit to make the fights easier. Some bosses have weak points where you’ll need to hit – otherwise, your attacks won’t do any damage. 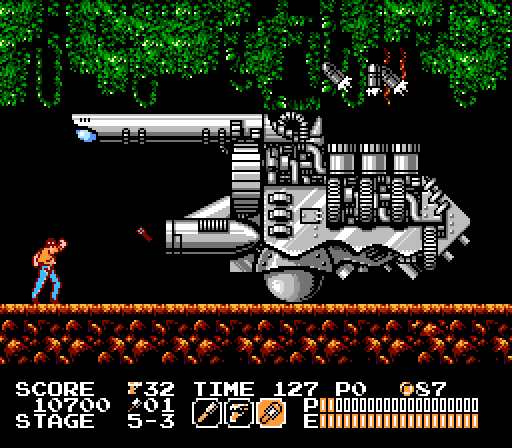 A nasty problem is that losing a boss fight sends you back to the beginning of the last stage segment before the boss, and those are not always very short. But it’s certainly nothing too bad. Car sections also have bosses, they are easy enough if you move around and avoid their attacks. Gun sections lack bosses. 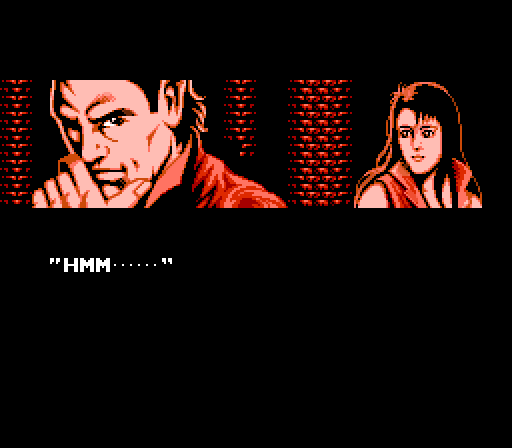 The cutscenes are quite pretty by NES standards. Yes, certain poses and motions in them repeat across the game, but that’s no big deal. They tell the game’s story nicely. As for the regular in-game sprites and environments, I’d say they are also good quality, certainly above the average for NES games. The music is also cool. I wouldn’t say any of the tunes are among the best game music of all time, but several of them stand out and add to the player’s overall enjoyment. The song I’ll share here is the one that plays in stages 6 and 8. 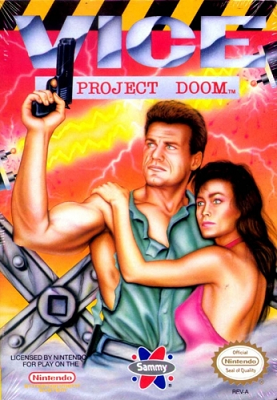 It’s games like Vice: Project Doom that make the 8-bit generation so great and unforgettable. It’s just so very well made, without any glitches to cause frustration, with a great difficulty curve and the infinite continues option that wasn’t commonplace until the generation of the original PlayStation. The three different play styles feature was also a rare sight at the time (and still is). The story is not very complex, but it is intriguing. Despite all this, Vice: Project Doom somehow flew under the radar, and this review could very well be the first time you’ve ever heard about it. But, now that you have, do find it and give it a try. It will not take you more than a few hours to beat, and I’m sure you’ll enjoy the experience thoroughly.